Jeff Bloch can not stand watching an abandoned airplane piled near his home. Together with his friend, he changed a former Cessna plane into a car that is ready for action on the streets. As quoted from Geeko System on Tuesday, May 28, 2016, the man who worked as a police officer along with his two friends to modify a former Cessna aircraft into a car named Spirit of LeMons and could be ridden on the streets legally. To be used on the street, he pinning a Toyota Van engine. 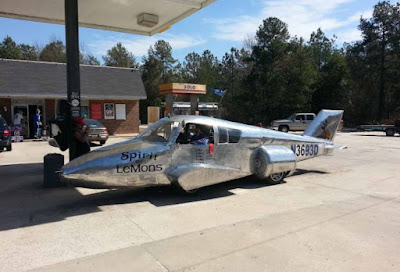 The modified plane-car can run at a top speed of 70 mph or 113 km/h. 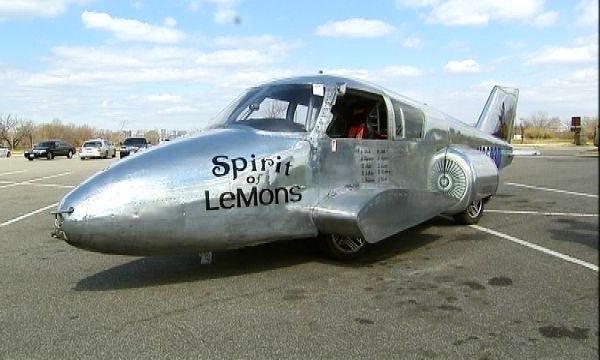 To test this modified plane-car, then Bloch registering The Spirit of LeMons to participated on the 24 Hours of Lemons, is an endurance competition event for junk cars, aka a parodi event to the 24 Hours of LeMans. On those event, Bloch and his plane-car won the title. "I do not intend to be at the race track, and I think this is not really cool and the best," said Bloch. More recently, Bloch made his Spirit of LeMons could run on the public streets legally. Then Bloch pinned a standard features on the car, such as the headlights, turn signal lights, brake lights, and even insured.